Offer feathers, various paint brushes, and watered down acrylic paints on top of newspaper for children to participate in a process-focused art activity by painting the feathers. Allow to dry. While children are creating, ask guiding questions about their art process. 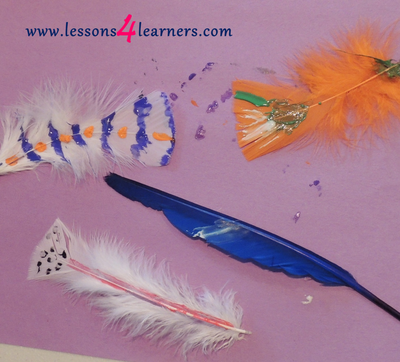 Optional: Create a mobile, garland, or mural with the feathers. Assess the child’s use of materials to express themselves through the visual arts. Please provide appropriate supervision to the children in your care when completing all activities. You will need to decide what types of activities are safe for the children in your care. Appropriate and reasonable caution should be used when providing art and sensory experiences for children.